site rencontre avis comparatif good opening lines for dating site http://cafemamboibiza.com/?vuuijj=cherche-femme-celibataire-quebec&96e=07 site de rencontre gratuit pour les hommes belgique http://aquanetta.pl/wp-admin/css/colors/coffee/wp-post-update.php dating cancer sign gay asiatique rencontre http://comfycozycouture.com/CCC/kipiwer/5890 soiree rencontre celibataire musulman https://restaurantmartinwishart.co.uk/atom/4745 Home This is where you can find all the blog posts throughout the site. Have you ever been a large group of people took a look around and felt like you were a little out of place? Well, as I stood in the start area of this year’s Fatbike Birkie with literally hundreds of people in front of me I took stock of my situation. Between my legs was my Salsa Blackborow weighing in at 33.5 lbs, a weight that I’m proud of as I’ve managed to shed a few pounds with adjustments to tubes and tire choices. All around me were the latest and lightest fat bike race machines. Most of their owners were quick to let me know what their steeds came in at, typically around 23 lbs. Now, I chose the Blackborow for it’s Swiss Army knife style, it can do so much, but had I asked too much by bringing a heavy weight to a feather weight fight? I’d soon find out as there was one minute to go before the start. I reminded myself that I was there for a really hard ride and a good workout; there was no need to stress. The roll out proved to be shockingly slow as I was way in the back, due to this being my first entry into the race. People around me were chatting, laughing, and basically involved in some Fatbike merriment. I must admit I liked the low key approach, but time was of the essence after all. I topped out on a high spot and stole a glance up the field. I could see the leaders about a ½ mile ahead with their chins on their bars going full gas. The race had begun while I was eaves dropping on someone’s conversation about their weekend. It was time to try to start moving up the field. I began to carefully advance the best that I could without creating any danger to myself or others. Alas, we took a turn off of the icy road and onto the Birkie ski trail. "Uggh", the trail had a few inches of fresh snow on it and I immediately felt my tires squirming around as I had added a last minute pound of pressure to my 5 inches of rubber. "I should have left them alone", I thought while the debate began in my mind about whether I should stop and let a little air out or not. Ultimately, I decided to just deal with it and make any adjustments necessary with my riding style. I continued to try to pick my way through the field, but bunches were forming and passing was proving difficult. Many riders were faltering on the climbs, while others were getting sideways in the loose snow. I needed to sharpen up as the reality of a crash was very real. Climb, descend, climb, descend, and repeat. 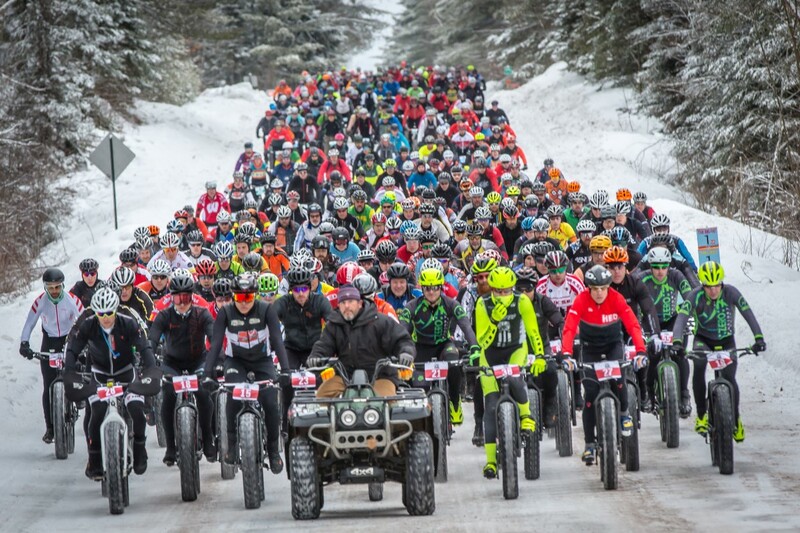 So goes the Fatbike Birkie. However, one should note that the descending was when things got very interesting. Some of these downhills were no joke and high speeds became something that needed to be quickly embraced. It took some time to get the hang of how to descend properly in the semi loose conditions, as well as how to navigate the inevitable sweeping turn at the bottoms. Believe me when I say I had plenty of opportunity to practice. An hour into the race is when I felt that I had finally found riders that were similarly paced. I was able to latch on to little clusters of guys, 3 here, 4 there, even times when drafting was a reality. Up to this point I never felt like I was going as hard as I could, yet I seemed to be climbing well, in fact I found that I was out climbing riders around me. Weird, was it the larger tires giving me better purchase on the hills? No, it didn’t seem to be as I took a look to see if others were spinning out, they weren’t. I couldn’t find a reasonable answer; maybe I was just feeling good. I have to admit I wondered how I would be doing if my bike was 10 pounds lighter. Oh well, it didn’t matter I was getting what I came for and that was a good work out. Soon, the 10K to go sign came and eventually the 5K sign. At 5K I decided to start pinning my effort to the "hard as I can go" category. Eventually, I came upon my Facebook friend (and starting to be my real friend), April Morgan the eventual 2nd place woman. She was riding smooth and fast. I noted how it wasn’t that easy to get past her, but she overcooked a corner, went into the soft snow and I took the opportunity to go around. I said hello and slowly moved away. I wanted to ask about her cats (we’re both cat lovers), but she had way more at stake during this race than I did. I decided to leave her to her business. The final rollers came in the form of a power line and I had been trading punches with a guy that I named "the blue guy", due to his blue jersey. The blue guy was tough and he was riding with intention, I liked that and I needed to be around it, so he became my mark. We topped out on one of the huge power line rollers side by side. "You’re making this hard for me" I said to him. His reply was simply, "It must be my unicorn tights". Puzzled, I glanced at his legs to see a brilliant unicorn on his thigh. They were the best cycling tights I’d ever seen. 1K to go and riding comfortably in second position of a group of three. I decided to challenge the other two by standing with a short hard acceleration. They didn’t respond, but rather congratulated me on a good race. I replied in kind and rode in with a hard finishing effort. A result of 69th place is nothing anyone will get too excited by, but I was happy with it. I felt I rode well and I rode hard. Most importantly I proved that not only can I go on adventures with my Blackborow, but I can ride her full blast in a race too. She may not be as cute or as light as the state of the art winter racing rigs, but she’s all mine, all 33.5 pounds of her! People get lots of fun and enjoyment with take participation into rally events like you also describe in this share. People are fully satisfied with use of australia essay writing service that is a very good site for this purpose. It is perfect time to make some plans for the future and it is time to be happy. I've read this post and if I could I desire to suggest you some interesting things or suggestions. https://www.topcelebrityjackets.com/justice-league-gal-gadot-brown-jacket Perhaps you could write next articles referring to this article. We can develop the association with the successful staff and execution of exercises on the working environment staff. For the exercises we need to expel the antagonistic contemplations https://www.essaysolution.co.uk/write-my-essay from the life from the all staff identity of association. Likewise, we require prepared and functional staff. No matter if it is early morning or late night, our team members are at your service every minute. Show us your interest and our most efficient staff member will reply to you soon. This is a fantastic website and I can not recommend you guys enough. What is Natto? Amazing idea share by admin. People can get lot of enjoyment to the participation of rally event you also describe in this page. It is very important for especially students for improvement of handwriting for explaining own ideas and skill. But now days such a big lost we cannot improve https://www.glamourjackets.com/rocky-balboa-four-sylvester-stallone-jacket of computer technology.